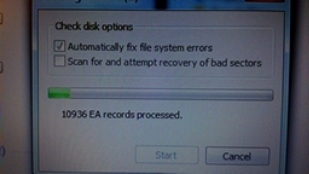 Scanning a laptop hard drive for errors. This is always fun. | Boz Rocks! Scanning a laptop hard drive for errors. This is always fun. PreviousFound some new social media tools… that’s always fun and interesting, and it keeps me up past my bed time. NextLooking at some old photos from our first couple years here. Where has the time gone?